I WANT TO LEARN MORE ABOUT FRN. WHERE DO I START? HOW DOES A FOOD RECOVERY NETWORK CHAPTER FUNCTION? WHAT IS A HUNGER-FIGHTING PARTNER AND HOW DO I FIND ONE FOR MY SCHOOL? WHAT IS THE ROLE OF FRN’S NATIONAL OFFICE? DOES IT COST MONEY TO BECOME AN FRN CHAPTER? HOW DO I KNOW IF THERE IS ALREADY AN FRN CHAPTER AT MY SCHOOL? DO I NEED TO BE A COLLEGE STUDENT TO START A FOOD RECOVERY NETWORK CHAPTER? DO I NEED TO BE A COLLEGE STUDENT TO VOLUNTEER WITH MY LOCAL FOOD RECOVERY NETWORK CHAPTER? IF WE CAN'T RECOVER FOOD EVERY DAY, ARE WE STILL ABLE TO BE AN OFFICIAL FOOD RECOVERY NETWORK CHAPTER? MY DINING MANAGER SAYS WE DON’T HAVE ANY FOOD WASTE. WHAT NOW? WE COMPOST OUR LEFTOVERS. WHY SHOULD WE RECOVER THEM INSTEAD? DO I NEED TO BE AN OFFICIAL CLUB ON MY CAMPUS BEFORE STARTING A FOOD RECOVERY NETWORK CHAPTER? HOW MANY PEOPLE DO I NEED TO START AN FRN CHAPTER? SHOULDN'T I TALK TO DINING FIRST? IF I TALK TO A HUNGER-FIGHTING PARTNER (SHELTER OR FOOD BANK) BEFORE TALKING TO DINING, WOULDN'T IT SEEM LIKE I'M GETTING THEIR HOPES UP? MY SCHOOL IS IN A TINY TOWN IN THE MIDDLE OF NOWHERE! WHAT IF THERE ARE NO SHELTERS NEARBY? WE HAVE A CLUB AT OUR SCHOOL THAT ALREADY RECOVERS FOOD. WHY SHOULD WE WORK WITH THEM TO BECOME AN FRN CHAPTER? WHY DO I NEED TO HAVE BI-WEEKLY CHECK-IN WITH MY POINT OF CONTACT ON THE PROGRAM TEAM? I DON'T HAVE ANY MONEY! HOW DO WE PAY FOR TRAYS AND GAS AND OTHER MATERIALS? CAN WE USE REUSABLE TRAYS/CONTAINERS? DO I HAVE TO BE CERTIFIED IN FOOD SAFETY BEFORE MY FIRST RECOVERY? WHAT IF SOMEONE GETS SICK FROM THE FOOD WE DONATE? STUDENTS ON MY OWN CAMPUS ARE FOOD INSECURE. HOW CAN OUR FRN CHAPTER HELP THEM? I GO TO A CULINARY SCHOOL. CAN WE RECOVER THE FOOD WE PREPARE DURING CLASS? Right here! This is a list of answers to questions that many FRNs (food recovery newbies) have. Take a look through the many pages of our website and visit our Facebook page and Twitter feed. Once you apply to start a chapter you will be contacted by a member of the FRN staff. Food Recovery is rescuing surplus food that would otherwise be wasted and giving it to hunger-fighting partner agencies. Students recover the surplus food from their dining hall bypackaging it, putting it in a freezer or fridge overnight, and then transport the food to a hunger fighting partner the next day. Of course, the process varies between schools and the nitty gritty will be determined by your dining hall, geographic area and capacity for volunteers. FRN National provides guidance and informational resources as well as grants to help chapters purchase recovery materials. The FRN National Team is in place to empower students as they form FRN chapters and to support existing chapters. This support includes: regular check-ins, resource sharing and consulting. While it does not cost money to join the network, you will have to purchase recovery materials. FRN can offer some funding. Yes, all of our chapters must be a student driven initiative. Faculty, staff and others are important allies and welcome to help students as mentors, advisers, or volunteers. No, non-students are welcome to volunteer with their local FRN chapter and your assistance as a driver or mentor would likely prove invaluable to the chapter and your community. Yes! You may need to start small to build strong relationships with your dining staff and your partner agency, or to gather enough student volunteers. Additionally some dining halls don’t have enough food waste to make daily pickups feasible - every chapter recovers at whatever pace is appropriate for their school. Ask your dining manager if they’ll allow you to do a food waste audit of the dining hall. Doing this audit will allow both you and your dining manager to see how much food is really being wasted and if it is worth it to recover it. Additionally, you can recover food from restaurants both on and off campus. Composting is a great thing to do with food scraps however we believe (and think you will too) feeding people is a better thing to do with perfectly good food than composting it. 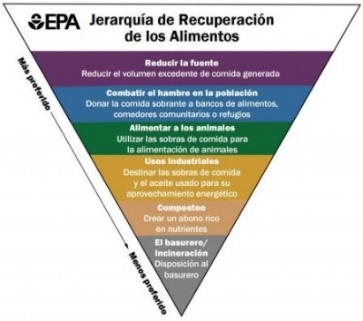 The US Environmental Protection Agency (EPA) names feeding hungry people as the number two most preferable way to reduce food waste (after source reduction) in their Food Recovery Hierarchy. No, it is not necessary for you to become a recognized student organization on your campus in order to be an official Food Recovery Network chapter. It is helpful when a chapter is an officially recognized organization or is an initiative of an official organization, but it is definitely not required! Ideally, you should have anywhere between three and seven core team members and between ten and one million general volunteers. This varies greatly depending on the size of your school. We recommend that you talk to dining after working through the other logistics (team, transportation, and partner agency). Our highest success rates have been from schools that go into their meeting with dining well prepared. It is much better to go in with an action plan than to go in with just an idea. The partner agency will be happy to hear about a potential new donor! Be sure to tell them that this is a possibility (rather than a guarantee) and they’ll be very understanding and excited at the prospect! Not to worry! You can donate food to any non-profit organization such as after school programs, retirement homes, or churches. Becoming an FRN chapter means you have the opportunity to apply for grants, have access to our program team and resources, attend conferences, and be featured on our website and national press releases. Check-ins are a great way for us to keep in touch with how all of our chapters are progressing and see how we can help them. FRN National has many resources that we can provide and a bi-weekly check -in makes sure you have all of them. FRN National invites our official chapters to apply for grant money to get started and to expand their impact. Chapters can request up to $150 per semester. Absolutely, we encourage our chapters to be as sustainable as possible. We can suggest reusable materials for you. Contact your FRN point of contact for more information on how to get this started. You do not need any type of certifications to recover food. However, we do give you some important information on food safety that you should be sure to review with your leaders and volunteers before starting your recoveries! For starters, your FRN chapter will increase food supplies at local pantries and shelters. If you would like information about donating more directly to students on your campus please contact programs@foodrecoverynetwork.org or ask your point of contact! Yes; if the food is prepared in an industrial kitchen that meets general food safety guidelines, you can recover it! We can help prepare you to talk to the directors of your culinary programs to organize this.